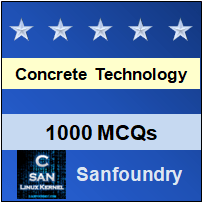 This set of Concrete Technology Multiple Choice Questions & Answers focuses on “Flaws in Concrete and Remedial Measures, Quality of Concrete”. 1. Which machine is preferred for abrasion test? Answer: A maximum value of 40%age is allowed for WBM base course in Indian conditions. 3. Aggregates to be used for wearing course, the impact value shouldn’t exceed __ percent. 4. What is the range of water absorption of aggregates used in road? 5. The loss in weight should not exceed __ percent when tested with sodium sulphate and __ percent with magnesium sulphate solution. 6. If 60% aggregates doesn’t pass through the 2.36mm sieve, then what would be the value of Aggregate impact value? 7. What C31 test under Standard ASTM test method? Explanation: According to Standard ASTM test methods to evaluate field-placed concrete C31 test is for Test Method for Making and Curing Concrete Test Specimens in the Field. 8. What C39 test under Standard ASTM test method? Explanation: According to Standard ASTM test methods to evaluate field-placed concrete C39 test is for Test Method for Compressive Strength of Cylindrical Specimen. 9. What C138 test under Standard ASTM test method? Explanation: According to Standard ASTM test methods to evaluate field-placed concrete C138 test is for Test Method for Unit Weight, Yield, and Air Content (Gravimetric) of Concrete. 10. What C143 test under Standard ASTM test method? Explanation: According to Standard ASTM test methods to evaluate field-placed concrete C143 test is for Test Method for Slump of Hydraulic Cement Concrete. 11. What C172 test under Standard ASTM test method? Explanation: According to Standard ASTM test methods to evaluate field-placed concrete C172 test is for Test Method for Sampling Freshly Mixed Concrete. 12. What C173 test under Standard ASTM test method? Explanation: According to Standard ASTM test methods to evaluate field-placed concrete C173 test is for Air Content of Freshly Mixed Concrete by the Volumetric Method. 13. What C 231 test under Standard ASTM test method? Explanation: According to Standard ASTM test methods to evaluate field-placed concrete C231 test is for Air Content of Freshly Mixed Concrete by the Pressure Method. 14. What C 1064 test under Standard ASTM test method? Explanation: According to Standard ASTM test methods to evaluate field-placed concrete C1064 test is for Temperature of Freshly Mixed Portland-Cement Concrete.